President Obama has declared a strategy of shifting the American military’s long-term focus toward the Pacific and an increasingly assertive China. 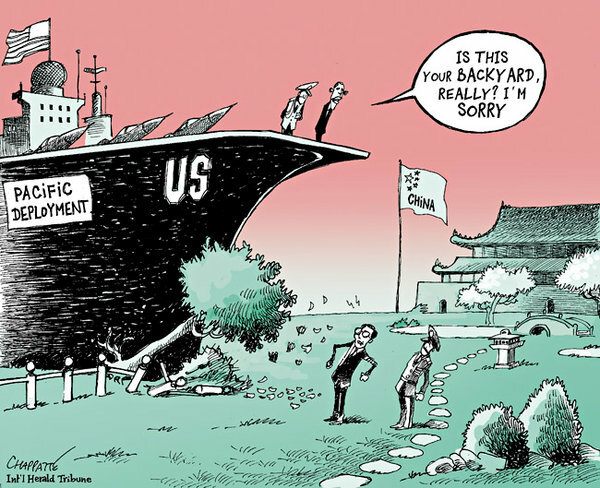 *Patrick Chappatte is an editorial cartoonist for the International Herald Tribune. View more of his work, visit his Web site or follow him on Twitter. Do you think that the major powers of this world is moving away from a realist approach and using ‘economic’ leverage as a form of ‘world power acquisition’; relative to the older realist times when ‘having a nuke’ was the main basis for world power? This is a difficult question to answer in a brief comment, but I will do my best for you. As for economic leverage, I guess I would say more so “yes,” than “no.” I assume by economic leverage, you are talking about global trade. Many countries have been charged with using economics as a tool, which many people characterize as being either mercantilism or even neo-imperialism. With that being said, I think soft power, rather hard power, is the more dominant force now. I say this because most countries are engaged in global trade via the Wto, while others are waiting to join. The idea is that we probably will not start a war with a country that trades with us (i.e., sort of Kant’s Perpetual Peace “ideal”). In other words, if there is dominance exerted, as you suggest, it is more due to soft power than hard power. And thank you for enlightening me too!